When it comes to enthusiasts, the Epox name is well known. In fact I know of many overclockers that wait to check out Epox's take on new chipsets before buying a new motherboard... Now that the nVidia nForce3-250 chipset is upon us, I think we'll see a few more enthusiasts jump on the Athlon64 bandwagon. After all, the biggest obstacle from an enthusiasts perspective are the system peripherals that don't like to run out of sync. That can cause a lot of the headaches. With AGP/PCI locks and with the ability to adjust clock multipliers, we should soon see motherboard clock speeds well past the 300 MHz mark, assuming the rest of the hardware can reach those heights of course. 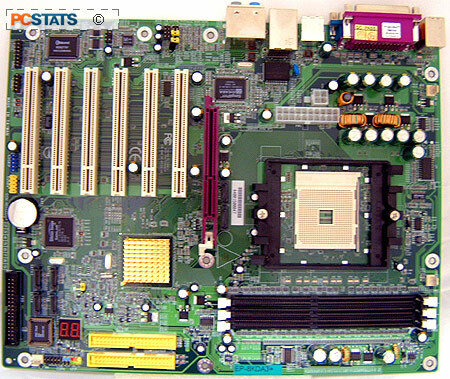 The socket 754, Athlon64-based Epox 8KDA3+ motherboard we'll be testing out on the following pages has a couple of features geared towards enthusiasts, and plenty of features for those of just looking for a solid AMD Athlon64 mainboard. For starters, the Epox 8KDA3+ boasts onboard Serial ATA RAID, Gigabit LAN (including hardware firewall), 7.1 channel audio, and of course the classic Epox Port 80 diagnostics card. For the enthusiasts, Epox also include in the package a set of eight small aluminum MOSFET sized heatsinks, they're not required to be used with the motherboard but it's never a bad idea to run things cooler. Since they come in a little bag, they can be attached with the pre-applied frag tape to whatever you like. Epox also bundle in two very nice purple rounded IDE cables which are soft and easily moldable. Curiously, a rounded floppy drive cable was not included. Finally, the Epox 8KDA3+ includes a small handy Slot/Phillips head screwdriver that is perfect for loosening case screws in a pinch. While pretty much everyone else in the market is trying to entice consumers with colourful PCB's and flashy fans, the Epox 8KDA3+ sticks with its customary colours. Makes you wonder just how many consumers actually base their purchases on how a component looks? 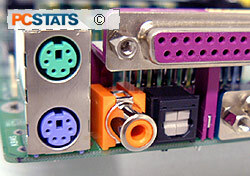 The layout of components on the EPox 8KDA3+ is generally is good; the main ATX power connector and ATX12V line are left of the CPU socket which puts them close to the MOSFETs, and out of the way too. Despite a lot of integrated peripherals, the EPox 8KDA3+ still includes six PCI slots for your expansion needs which is always a plus. The rear IO has both an optical and RCA SPDIF connector, four USB2.0 headers, and a multitude of jack-sensing audio connectors for the 7.1 channel set up; Green jack (2 front speakers), black jack (2 rear speakers), grey (2 side speakers) and orange (centre & subwoofer speakers). One thing I've noticed from testing several nForce3-250 powered motherboards, is that at least two of the nVIDIA Serial ATA channels are always under the CPU socket, just between it and the 8X AGP port. I hope that's not a trend that the other manufacturers continue, as it is darn hard to reach these two ports, and the SATA cables will undoubtedly interfere with 3rd party videocard coolers.